I will be the first to put my hands up and say I can be a fussy eater. There are a few things which I really struggle to eat. They are mushrooms, bananas, eggs and curries. I struggle to smell them, let alone eat them. I don’t want Piglet to have the same aversions purely because he hasn’t been exposed to those foods, so I make sure to give him them all on a regular basis. Cooking eggs is even one of the reasons why I think I am rocking motherhood. Curry has proven to be a lot harder though. As I am not accustomed to cooking using those spices I was not sure what would be a suitable amount to give Piglet. He adores strong flavours so I was sure he’d love it, but I would shy away from the unknown in fear of making a disgusting mistake! I’m not ashamed to admit I’ve not really seen the point in weaning books before. I believe much of it is about trusting your instincts and letting your little one experience a range of foods. It’s safe to say now though, my mind has been changed! 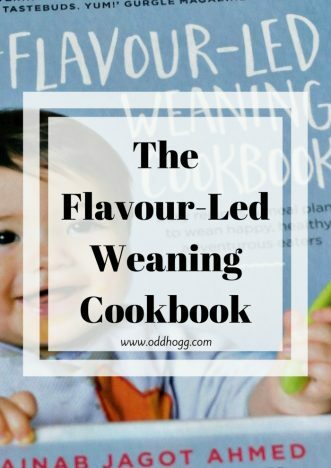 The Flavour-led Weaning Cookbook has over 100 recipes for babies, ranging from first tastes right up to toddler meals that the whole family will enjoy. I really truly wish I’d had it when we started weaning. It doesn’t matter if you are doing traditional weaning, baby led weaning or a combination, there is a section of the book right for you. You are eased into the concept of flavour led weaning with the image of a flower. This is followed by a plan of the 4 stages they recommend, along with additional notes for those following baby led weaning. The introduce the herbs and spices which are used throughout the recipes with extra guidance on introducing them. Perfect for people who are more wary like me! Stage 1 is purees, and you are provided with a variety of first taste puree suggestions to get you through the first fortnight. You are also given a meal plan to help you decide the best way to introduce the flavours. The second phase of stage 1 is mixed purees, and again you are given the recipes followed by a suggested meal plan for 1 week. The third phase of stage 1 is where things get really interesting. This is when you are given the recipes for adding basic herbs and spices – they call it the flavour-switch. This is the part I missed out when I was weaning Piglet and I really wish I hadn’t! Stage 2 is where the meals start to resemble more “real food”. The recipes are a bit more complex, but still using mostly store cupboard essentials. In stage 2 the recipes are designed to be mashed to provide a lumpy texture, however I have found that Piglet really enjoys these meals. As he is now one year old I simply don’t blend them at all and give them to him whole and he scoffs the lot. My favourite recipe in this stage is the chilli con carne. We eat a lot of chilli in our house, but I was never sure how to make it in a way that Piglet could eat in too. There is a fab recipe that we are all enjoying now! There is a whole stage dedicated to finger foods. I opted to do combination weaning with Piglet, so he would have his main meal in puree or mashed form but with some finger food to try out too. There are loads of options of things to cook in this section. Stage 3 is all about chunkier meals and new flavour blends. I cooked up the matter keema curry for Piglet as my first recipe from the book and he loved it. The recipe gave plenty left over for freezer portions too and he’s had it at least once a week since. It is my new go to meal when he’s in a fussy mood as I know he will eat it. The final stage, stage 4, is the big table meals. The stage is prefaced with information on portion sizes, appetite expectations and family meal times. This is a huge stage with some fabulous recipes. We have made the aromatic roast chicken and the roasted vegetable lasagne and thoroughly enjoyed them both. After all of the recipes there are some pages providing extra information. This includes a table with flavour inspiration for herbs and spices that work well together. There is a table on natural remedies, and which spices are believed to help with some minor ailments, and even a section on abbreviations and conversions to help with the recipes. I don’t even know where to start! There are recipes using chicken, lamb, beef, fish or vegetarian and it really is a great variation of textures and flavours. It’s tough to choose a favourite. I would possibly say the keema, as Piglet loves it, but if I was choosing one for the whole family it would be the chilli con carne. We eat a lot of chilli in our house, but I was never sure how to make it in a way that Piglet could eat it too. There is a fab recipe that we are all enjoying now! Although most recipes include what I would consider curry spices, they are not all like that. Even as someone who dislikes curry, I have found some of the recipes palatable for myself – and Piglet hasn’t refused one since I started cooking them. If you haven’t been able to tell up to this point – I love it. It is quite possibly my favourite item that I have reviewed on the blog so far, and that’s quite a bold statement to make. If you are about to start weaning – get this book. If you have already started weaning – get this book. If you want toddler meal ideas full of flavour – get this book. It is available now to buy on amazon now. 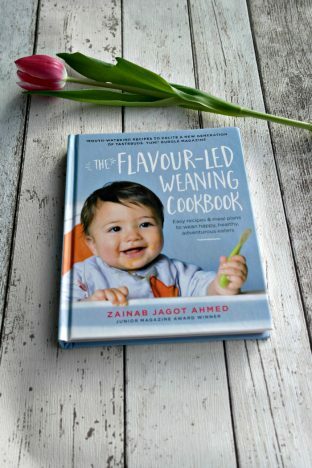 I was sent a copy of The Flavour-Led Weaning Cookbook for the purposes of carrying out a review. All words and opinions are my own. This book looks great, i always cook with spices. Itsa good way to add a bit of flavour. I have always tended to use herbs instead of spices – just my personal preference. I have appreciated the guidance from this book though!